The older I get, the more nostalgic I tend to be about days gone by. Especially when it comes to TV. I’m finding myself a little misty-eyed as I watch this old episode of Fishing Tales with Mike Sakamoto, a super local Hawaiian fishing show and favorite of my grandpa’s in the ’80s. Grandpa would whistle happily along to the “Let’s Go Fishing” theme song as he was in the kitchen cooking dinner–at times preparing fish that he had caught himself fishing that day. I don’t pretend to be as talented of a fish cook as my grandpa, but I do like to experiment with a “fresh catch” from the Berkeley Bowl now and then. Here are three of my latest endeavors: 1) Classic Misoyaki Butterfish, 2) Baked Sockeye Salmon with Capers, 3) Lazy Ono (wahoo) with Scorched Tomatoes. 1. 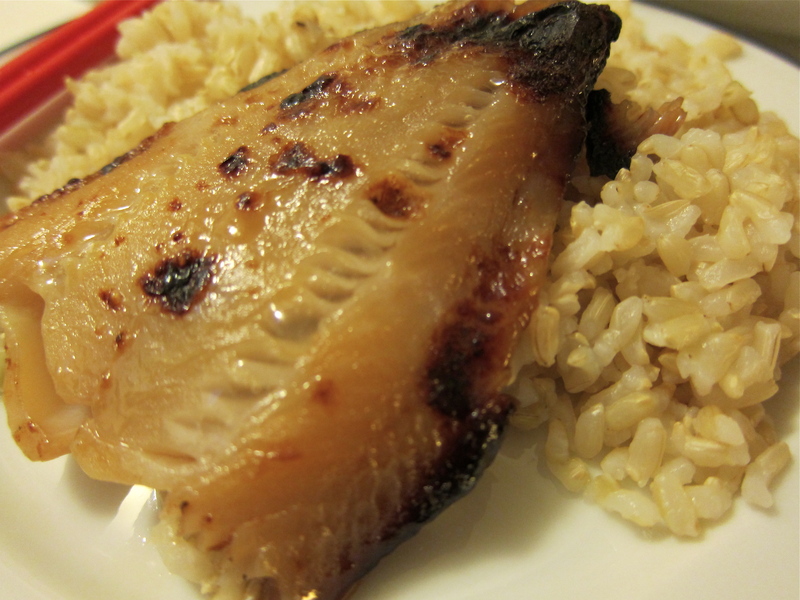 Misoyaki Butterfish is a no-brainer. You’ll see this served at many restaurants these days as Miso Black Cod. I can’t say I really care which fish it is, I just love any fatty oily white fish marinated overnight in miso, sake and sugar, broiled until lusciously caramelized. Your chopsticks will slide elegantly between each flaky layer of fish, right into your mouth. The secret is to wipe off all of the marinate before you cook it, otherwise caramelization will not occur! 2. 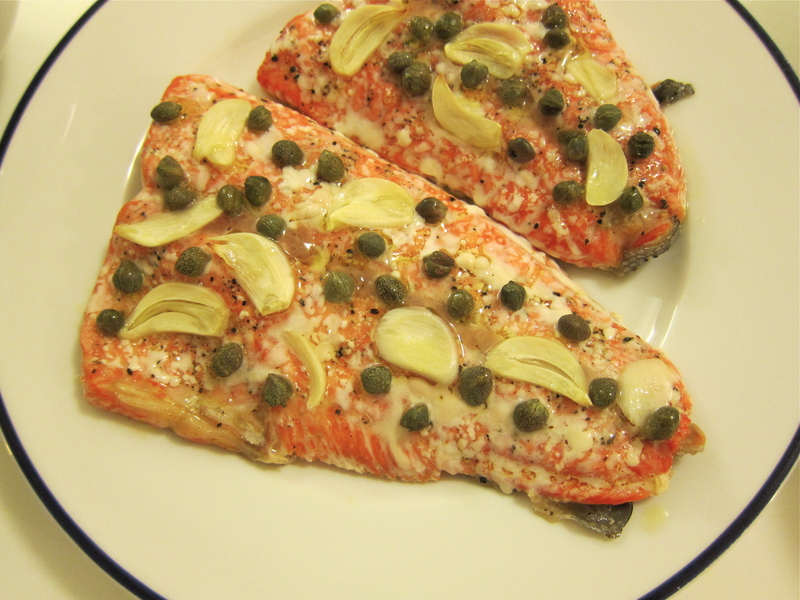 I found this recipe for Baked Sockeye Salmon with Capers on Epicurious–it was all an elaborate excuse to utilize my new iPad in the kitchen. I had purchased two lovely vibrant pink filets of wild sockeye salmon from Berkeley Bowl and dug through my pantry to cobble together a recipe. While not the most gourmet recipe, you can’t really mess up impeccably fresh salmon with a bit of garlic, evoo, and capers. 3. I was tired and hungry after work one evening, when I happened upon Trader Joe’s frozen Hawaiian Ono (wahoo) steaks. 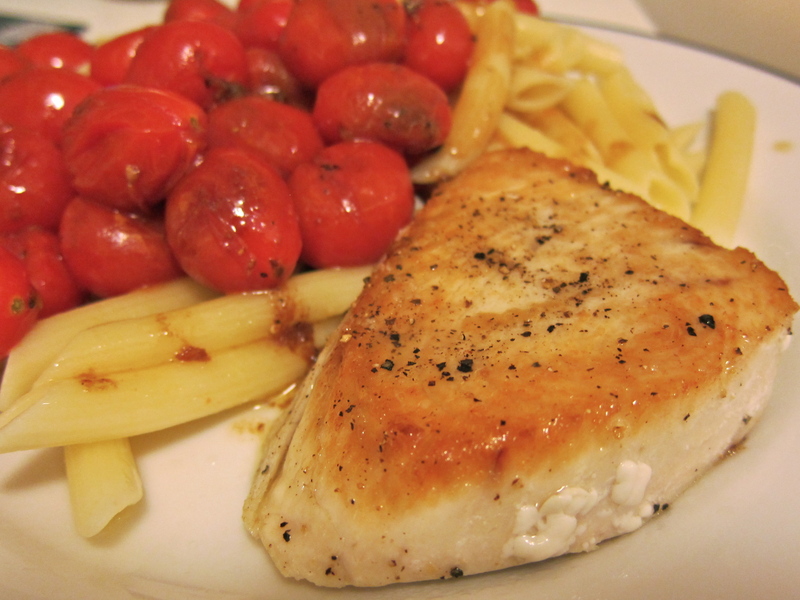 I improvised a quick pan sear, then scorched some grape tomatoes in the crusty pan. I buttered up the pan juices and poured the lot of buttery brine over my pasta. Happiness! Combine miring, sake, and sugar in a small pot. Bring to a simmer stirring constantly until sugar is dissolved. Simmer for 2-3 minutes, until all the alcohol burns off. Remove from heat, and add soy sauce to stop boiling. Slowly add the miso and mix until sauce is creamy. Do not ever boil miso. Once the sauce is cool, coat all sides of your fish and place into a glass baking dish or ziploc bag. Marinate for at least 24 hours for thin filets, or 2-3 days for thicker black cod steaks. Preheat oven to 450-degrees. Wipe the marinate completely off of the fish (this is important to achieve caramelization, and bake 5-8 minutes. When fish seems almost cooked, broil for an additional 2-3 minutes until well caramelized. Serves 2-4. Wash the fish in cold water and pat dry with paper towels. Coat a baking dish with 2 tablespoons of olive oil. Lay the salmon down in the pan, skin side facing down. Distribute the capers and garlic slices between the filets. Sprinkle with a liberal quantity of salt and black pepper. Pour the remaining olive oil over the fish. Put the dish in the preheated oven and cook for 16 minutes. Let it stand for a few minutes before serving. Serves 4. Drizzle olive oil all over the ono steak, then sprinkle on salt and fresh cracked pepper on both sides. Preheat a pan on med-high and cook the steaks 4 to 5 minutes each side. Ono is a quick cooking fish, so be sure not to over cook it! Once the ono is cooked, remove and plate it with the cooked pasta. Add grape tomatoes to the pan you cooked the fish in, and roll the tomatoes around until they’re scorched on all sides. I like to squish a few of them to create a juice that deglazes the fish crusties in the pan–rub the brown fond with a spatula until mixed with the tomato juices. When the tomatoes are soft, add a knob of butter. Once melted, pour everything over your fish and pasta. Serves 1. I had all the best intentions. I was going to make a healthy version of meatloaf. 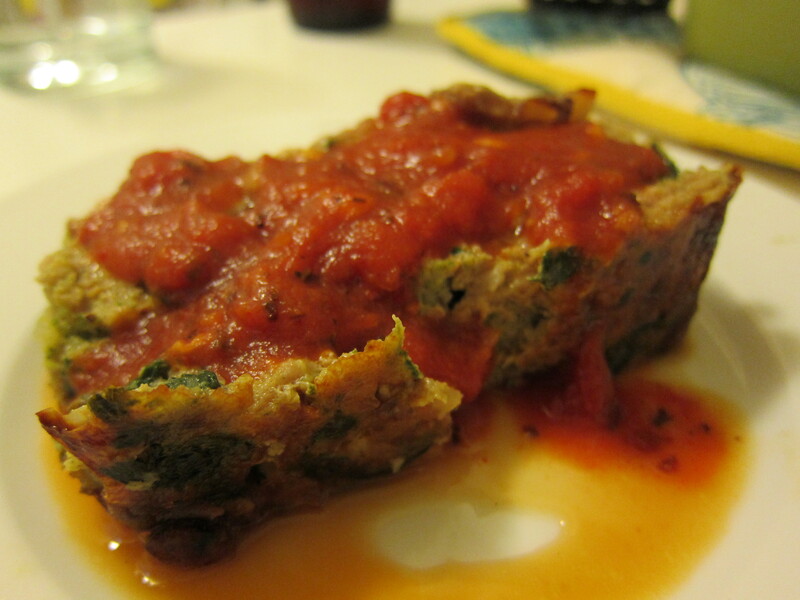 J and I had watched this Chow video on Roku with the recipe for what promised to be the most delicious meatloaf, ever. 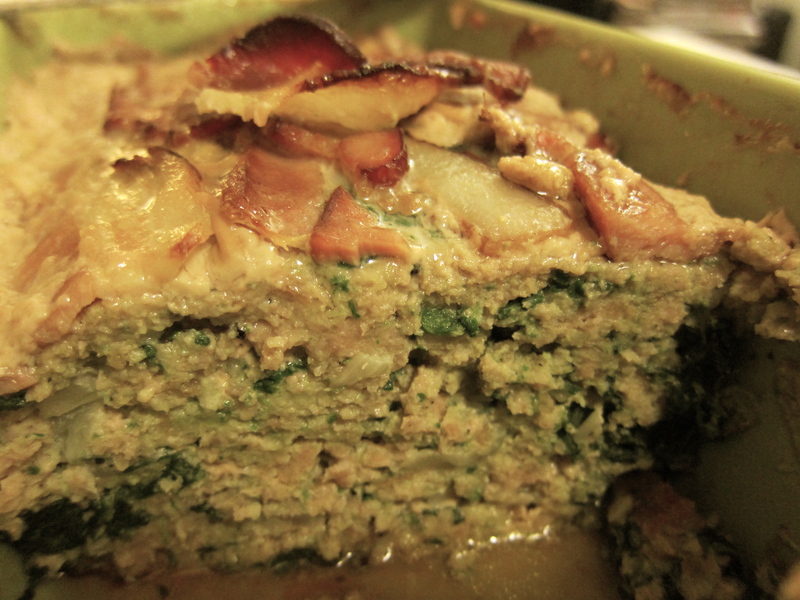 A meatloaf infused with spinach and swathed in bacon for the moistest log of meat you’d ever seen. I took a risk. Instead of using the prescribed combination of ground beef, pork, and veal, I selected turkey (*gasp*). Meatloaf, no. Foulloaf, maybe? J was bugging me to cook more healthy meat, so this was our compromise: turkey wrapped in bacon. Though a bit tedious (you gotta get out a blender), this recipe produced a luscious loaf even with my substitution of turkey. I also like that you pat the mixture into a loaf pan instead free forming it. The turkey oozed a layer of fatty scum that enveloped the beautiful slices of bacon preventing them from becoming golden brown–that was pretty much the only downside. The bacon flavor still penetrated as I hoped it would. I also opted for a pre-made Trader Joe’s organic pomodoro sauce and it blended right in as if I had made it be scratch, too. Definitely delicious, but it’ll be real meat next time. Transfer the spinach to a colander and douse with cold water to chill. Drain and press with your hands to extract most of the moisture. Coarsely chop the spinach. Place the meat in a large bowl, followed by the chopped spinach, breadcrumbs, garlic, measured salt and pepper, and nutmeg (no need to mix yet); set aside. Place the celery, parsley, and milk in a blender and blend until puréed. Add to the meat mixture. Melt the butter in a small skillet over medium heat until foaming. Add the onion, season with salt and pepper, and cook, stirring occasionally, until softened and translucent, about 4 minutes. Add to the meat mixture. Add the eggs to the meat mixture and, using clean hands, mix everything until evenly combined (don’t squeeze or overwork the mixture). If desired, test for seasoning by forming a small patty and cooking it in the small skillet over medium heat until no longer pink inside. Taste the patty and add more salt and pepper to the meat mixture as needed. Repeat the seasoning test as needed. Transfer the mixture to a 9-by-5-inch loaf pan, spread to the edges, and smooth out the top. Cover the meatloaf with the bacon slices, laying them lengthwise and side by side. Bake in the oven until just cooked through, turning the pan 180 degrees halfway through, about 1 to 1 1/4 hours. Pour off the excess fat and let the meatloaf stand for 20 minutes before slicing. If you choose, serve with tomato sauce.